For the Wikipedia assignments, we will use this WikiEdu class page and dashboard. Everything else will be linked on this page. Examines the relationships and groups formed through digital social media. Focuses on how people manage interactions and identities, develop interpersonal relationships, engage in collaboration and conflict, and develop communities in online environments. Involves both the study and use of network-based computer-mediated systems. Digital social media has radically and rapidly transformed the nature of how we communicate and interact. When this class was first offered at UW many years ago, instructors might hope to introduce students to online communities and computer-mediated communication for the first time. Today, online communities are central parts of each of our daily lives and have an important impact on our cultural, social, and economic experience of the world and each other. This course combines an in-depth look into several decades of research into online communities and computer-mediated communication with exercises that aim to give students experience applying this research to the evaluation of, and hands-on participation in, online communities. As students of communication in the twenty-first century, I expect that many of you taking this course will, after graduation, work in jobs that involve communicating, working with, or managing online communities. This class seeks to inform these experiences by helping you learn how to use and contribute to online communities more effectively and how to construct, improve, or design your own online communities. Recall, compare, and give examples of key theories that seek to explain why some online communities grow and attract participants while others do not. Demonstrate an ability to critically apply the theories from the course to the evaluation of a real online community of your choice. Engage with the course material and compellingly present your own ideas and reflections in writing and orally. Write and speak fluently about the rules and norms of the Wikipedia community and demonstrate this fluency through successful contributions to Wikipedia. Although details on this syllabus will change, I will try to ensure that I never change readings more than six days before they are due. This means that if I don't fill in a "To Be Determined" one week before it's due, it is dropped. This also means that if you plan to read more than one week ahead, contact me first. Closely monitor your email or the announcements section on the course website on Canvas. Because this a wiki, you will be able to track every change by clicking the history button on this page when I make changes. I will summarize these changes in an announcement on Canvas once week that will be emailed to everybody in the class. I will ask the class for voluntary anonymous feedback frequently — especially toward the beginning of the quarter. Please let me know what is working and what can be improved. This course is organized into two components that roughly span the first and second halves of the quarter. Kraut, Robert E., and Paul Resnick. 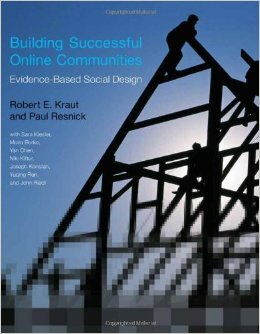 Building Successful Online Communities: Evidence-Based Social Design. The MIT Press, 2012. MIT Press sells the book for $31 as a paperback. Amazon has a limited number of hardcover copies available, starting at $36 as of December 3rd 2018. They also have paperbacks starting at $24 and the Kindle version is $17. Wikipedia has this long list of possible book sources. Motivation: How do online communities incentivize participation? Commitment: How do online communities build relationships to keep individuals involved? Rules and Governance: How do online communities create norms, rules, and governance? Newcomers: How do online communities attract — or fail to attract — newcomers? Creation: How should one start a new online community? In order to ground the theoretical readings during the first half of the quarter, there will be weekly assignments that provide a structured opportunity to learn about and become involved in Wikipedia. You should keep in mind that the bulk of the reading in the course — and most of the most difficult material — will be front-loaded in this first five week period. The goal is to make sure that you have all the tools you'll need by Week 7 so that you can use this material to focus on your projects. In the second half of the course, we will focus less on theory and more on examples of online communities and on applications, examples, and challenges, associated with interpersonal media and computer-mediated communication. Our reading during the second part of the quarter will be focused on cases studies. We will also focus on in-class discussions and exercises that prompt critical consideration of how online communities take place in different domains as well as the challenges associated with using online communities. Our goal here is to build up the ability to critically understand these communities in terms of the theory we covered earlier. In general, readings during this second component will be on the lighter side and there will be no weekly assignments other than reading. The readings are lighter during this component because I'm expecting you to be spending time outside of class working on your projects. The assignments in this class are designed to give you an opportunity to try your hand at using the conceptual material taught in the class. There will be no exams or quizzes. Unless otherwise noted, all assignments are due at the end of the day (i.e., 11:59pm on the day they are due). The course relies heavily on participation, discussion, and the case study method. A standard "case" usually involves reading an example — perhaps up to 20-35 pages of background about an organization or group facing an ambiguous or difficult challenge. I will mark certain readings as "[Cases]" in the syllabus and I will expect you to read these particularly closely. It is important to realize that we will not summarize case material in class and I will not cover it in lecture. I expect you all to have read it and we will jump in and start discussing it. Cases ask students to put themselves in the positions of individuals facing difficult situations to tease out the tensions and forces at play in the case and to construct — through group discussion — the broader lessons and takeaways. Cases are a wonderful way to connect the sometimes abstract concepts taught in many academic courses to real examples of the type of ambiguous situations that you will likely encounter in your career. Generally speaking, there are not right and wrong answers in cases. Typically, professors teaching cases cold call on students in rooms of hundred students. Since our class will be smaller than a typical case-based class, cold calling might not be necessary very often although I will sometimes use it and you should always be ready to answer every question. That said, I do expect every student to be in class every week and to be prepared to discuss the cases and the readings. If you have not spoken all class, I may cold call on you. The "Participation Rubric" section of the detailed page on assessment gives the rubric I will use in evaluating participation. You will hand in two papers in this class. In both cases, I will ask you to connect something you have experience or knowledge about to course material. The "Writing Rubric" section of the detailed page on assessment gives the rubric I will use to evaluate these papers. In the first project, you will be asked to learn about Wikipedia, its norms, rules, and processes. With this knowledge, you will all be asked to research and write a new article in Wikipedia on a topic of your choice and to publish this article in the encyclopedia. As part of this process, you will interact with other community members who are not part of the class. Afterward, you will be asked to write a short essay piece to reflect on this process and to connect your experience to the conceptual course material where appropriate. We will use material from WikiEdu, a program by the Wikimedia Foundation, to help you learn how to participate in Wikipedia. Every Friday during this first component of this class, there will be a assignment due that corresponds to one step in the process of getting involved in Wikipedia. Most weeks this will involve completing learning modules and assignments in WikiEdu. These Wikipedia participation assignments won't be synced up with the theory, but they will provide with you lots of opportunity to reflect on the theoretical work we are covering. Although only Task #6 includes anything that you will need to turn in to me, you will need to participate in Wikipedia each week. I will be able to see this activity and I will help you. We will take time each week to discuss our progress and experience with Wikipedia and to connect it explicitly to the theoretical concepts we are covering. Make contributions in Wikipedia. Do the "evaluate Wikipedia" assignment in WikiEdu. Complete the WikiEdu training and assignments for week 1. During this training, you will create an account, make edits in a sandbox, and learn the basic rules of the Wikipedia community. Once you have created an account, you must enroll in the course so that your account on Wikipedia is associated with the course and so that I can track your activity on Wikipedia. Click this link to enroll in the course. If you are asked for a passcode, you can enter zygfdiua. Complete the online training topics for week 2. To practice editing and communicating on Wikipedia, introduce yourself to me and at least one classmate on Wikipedia. My username is Groceryheist. You can find a list of all of your classmates on the WikiEdu class page. Decide on an article you would like to create or a stub article you would like to significantly expand and improve (see below). Tell me what article you want by leaving a message on my user talk page. Requested Articles — This is a list of articles that others have asked to be created. It is sorted into categories and sub-categories. When you're looking at the list, remember that it's possible that somebody else has "gotten" to them first and forgot to remove it. Remember that a red link indicates that there is no page with that name. List of Stubs — This is an extremely long list of articles that are currently stubs and which is also sorted into categories and then subcategories. It might be a little bit out of date so be sure to click through before you decide on an article. Write a 2-3 paragraph summary version of your article—with citations—in your Wikipedia sandbox. Add the URL For your sandboxed article to yourself on the course WikiEdu page by clicking the assign article button next to your name and assigning the URL for your sandbox to yourself. Select two classmates’ articles that you will peer review and copy-edit. To sign up, you can mark this in the the dashboard by using the Assign a review' button. Try to pick articles that other students are not yet reviewing. Peer review two of your classmates’ articles. Leave suggestions on the article talk pages for how to improve them. Improve and copy-edit the two reviewed articles to help fix issues, improve sourcing, create a more neutral or encyclopedic tone, etc. Move sandbox articles into the "(Article)" name space by using the "Move" tab, by setting the namespace to "(Article)" and by setting the page title to be whatever you want the article to be named. Once you have moved the article, visit the list of students in the WikiEdu dashboard and (a) assign the new URL to yourself and (b) remove the old one by clicking the "+" button to open the menu and using the "-" button next to the old "sandbox" copy of your article. You need to press "Save" at the top of the page once you are done. Finish article in Wikipedia and turn in link to article in Canvas. Turn in report as subpage of your Wikipedia userpage and turn in link in Canvas. Post your report as a subpage of your userpage. For example, I would create mine with http://en.wikipedia.org/wiki/User:Groceryheist/Report as the URL. Of course, you should replace "Groceryheist" with your Wikipedia username. You can also just go to your userpage by clicking on your username on Wikipedia and then adding "/Report" at the end of the the URL. When you go that page, it will say Wikipedia does not have a user page with this exact name. You can create the new page by just clicking the "Create" tab on that page. When you're done, you can paste the URL into Canvas. Your Wikipedia article will be evaluated based on your demonstrated understanding of Wikipedia rules and policies. Is it a good article by Wikipedia's standards? In addition to finishing up your Wikipedia article, everybody should turn in a report reflecting on your experience contributing to Wikipedia in light of your experience and the course material and, most importantly, offering advice to the Wikimedia Foundation and the Wikipedia Community on how to improve their community. I want you all to treat this as a dress rehearsal for your final projects. Provide detailed, concrete, and actionable advice to the Wikipedia community and the Wikimedia Foundation. What should Wikipedia think about doing? What should they think about changing? Comment directly on your experience in Wikipedia. What did you do and what did you learn? Connect your experience in Wikipedia explicitly to the concepts in the course material we have covered. Justify your recommendations in terms of the theories and principles we've covered. Why should your recommendations be taken more seriously than just random advice from one new user? If possible, reflect on what parts of the theories or concepts we covered applied or didn't. You don't have to take everything taught in the course for granted. What would you change or add based on your experience? What is unique or different about Wikipedia? I will give everybody in the course feedback on their assignment. The basic structure is shorter, but extremely similar, to what you will be doing in the final project. As a result, you can treat this as a "mid-term" and make adjustments based on feedback. For the final assignment, I want you to take what you've learned in the class and apply it to a community you have observed or participated in. This project will involve two written assignments and a presentation. In this assignment, you should identify a community you are interested in — and that you hope to analyze critically in your final project. In this assignment, I am asking you to write 1-2 paragraphs explaining what community you want to study, why you care about it, and why you think it would be a rich site for reflection. If relevant or possible, it might be useful to also provide a link. I am hoping that each of you will pick a community that you are intellectually committed to and invested in your personal or work life. You should also keep in mind that you will be presenting this publicly to the class. You will be successful in this assignment if you identify a community and clearly explain why you think it would be a useful community to study using the concepts we have covered in the class. I will give you feedback on these write-ups and will let you each know if I think you have identified a project that might be too ambitious, too trivial, too broad, too narrow, etc. Each project should include: (a) the description of the community you have identified (you are welcome to borrow from your Community Identification assignment), (b) a description of how you would use the course concepts to change and improve the community. You will be evaluated on the degree to which you have demonstrated that you understand and have engaged with the course material and not on specifics of your community. I want you to reflect on what parts of theory we covered apply or do not. What does the community do right according to what you've learned? What might it do differently in the future based on what you've read? What did the course and readings not teach that they should have? A successful project will tell a compelling story and will engage with, and improve upon, the course material to teach an audience that includes me, your classmates, and students taking this class in future years, how to take advantage of online communities more effectively. The very best papers will give us all a new understanding of some aspect of course material and change the way I teach some portion of this course in the future. Come to class with an mnemonic linking your name with something interesting about yourself you want to share. For instance, I like skiing so for me it will be: Nate the Nordic. [Case] TED Talk by Jimmy Wales on "How a ragtag band created Wikipedia"
[Case] Liberapay's website's About Page, FAQ, About Teams, stats, Payroll. The Librepay system succeeds Gratipay, which itself succeeded another similar system called Gittip. Try to understand what you can and we'll work the details out in class. [Case] David Heinemeier Hansson's article on "The perils of mixing open source and money"
[Case] Chad Whitacre's article on "Resentment"
[Case] Mike Linksvayer's article on "I support advertising on Wikipedia"
[Case] Sangeet Choudary, 2014 What is a Network Effect and how can one fail? [Case] Slashdot: Spend 5-10 minutes to visit the homepage, look at a story you think is interesting, and read several of the comments, paying specific attention to the rating system. [Case] Visit Zooniverse and create an account. Then visit the Planet Hunters website and log in with your account. Spent 10-15 minutes on the site figure out how it work and doing a few tasks. [Case] Kiene, C., Monroy-Hernández, A., & Hill, B. M. (2016). Surviving an “Eternal September”: How an Online Community Managed a Surge of Newcomers. In Proceedings of the 2016 CHI Conference on Human Factors in Computing Systems (pp. 1152–1156). New York, NY, USA: ACM. Hill, Benjamin Mako. Almost Wikipedia, 2013. [Case] Snowdrift.coop: Read at least the top page, about page, how it works, the original intro, mission, FAQ, "How to Help" page, and next steps page and poke around on the rest of the site. Bilton, Nick. “All Is Fair in Love and Twitter.” The New York Times, October 9, 2013, sec. Magazine. In the first half of today's class we'll be visited by Jonathan Morgan, an expert on newcomers to Wikipedia, a PhD graduate from UW, currently an employee of the Wikimedia Foundation, and the first author of the paper we'll be reading as our case today. In the second half of class, we will have a visit from local Wikipedia group Cascadia Wikimedians (full disclosure, I am a member). Prepare to give a very short (~1 minute ) in-class presentation about your Wikipedia editing experience and also be ready with questions for them about your experience or about Wikipedia in general based on the readings and cases we've done so far. Teahouse questions forum: What do the questions here tell you about the kinds of challenges that new editors face? How does this jibe with your own experience as a new Wikipedian? Teahouse host profiles: What do the profiles on this page tell you about the demographics and motivations of Teahouse Hosts? Does anything about the Teahouse host characteristics and motivations you read in these profiles surprise you? Why or why not? Teahouse guest profiles and Guest book: What do the profiles on this page tell you about the demographics and motivations of Teahouse visitors? Does anything about the Teahouse guest characteristics and motivations you read in these profiles surprise you? Why or why not? We have a special guest this week: Andrés Monroy-Hernandez! Andrés was previously at Microsoft Research and is currently a lead research scientist at Snap Inc., the maker of Snapchat. Andrés has research interests ranging from civic communities to educational communities and more recently he is focusing on "social computing systems," which we will learn about today. Howe, J. (2006). The rise of crowdsourcing. Wired Magazine, 14(6), 1–4. [Case] Amazon Mechanical Turk Best Practices Guide. Agapie, E., & Monroy-Hernández, A. (2015). Eventful: Crowdsourcing Local News Reporting. arXiv:1507.01300 [Cs]. Fogel, K. (2009). Producing Open Source Software. Introduction - includes "History" & "The Situation Today." You'll need to press "next" to turn the page once. [Case] Stallman, R. (1984). The GNU manifesto. [Case] Stallman, R. (1989). The GNU general public license, version 1. Debian (1997). Debian social contract, version 1.0. Today we have a special guest: Professor Mako! Mako is my PhD advisor and his PhD advisor was Eric von Hippel, whose book we are reading for today. von Hippel, E. (2005). Democratizing innovation. Read Chapters 1, 2 & 5. [Case] C.H.D.K. Wiki Take a look at the [Home page https://chdk.fandom.com/wiki/CHDK] and explore the Wiki to get a good idea of what this community is about, what they do, and how it works. Bulletin board system article on Wikipedia. [Case] Hafner, K. (1997). The epic saga of the WELL. [Case] Turner, F. (2005). Where the counterculture met the new economy: The WELL and the origins of virtual community. Guest Lecture from Sayamindu Dasgupta who is a professor at the Information School at the University of North Carolina, Chapel Hill. Roque, R.; Dasgupta, S.; Costanza-Chock, S. Children’s Civic Engagement in the Scratch Online Community. Soc. Sci. 2016, 5, 55. Brennan, K., Monroy‐Hernández, A., & Resnick, M. (2010). Making projects, making friends: Online community as catalyst for interactive media creation. New directions for youth development, 2010(128), 75-83. Visit the site. Read the about page, the the information for parents, and for educators. Watch all the videos. Spend some time exploring and run some programs (try to find at least one animation and at least one game). For the case we're going to compare scratch to a different: Block Studio. This is an experimental project by Raoul, a PhD student at UW. Click start and watch the three lessons. You don't have to actually make any games with Block Studio, but do learn how it works as much as you can. After that survey the published projects. The final classes will be devoted entirely to presentations. As detailed in my page on assessment, attendance in class is expected of all participants. If you need to miss class for any reason, please contact a member of the teaching team ahead of time (email is best). Multiple unexplained absences will likely result in a lower grade or (in extreme circumstances) a failing grade. In the event of an absence, you are responsible for obtaining class notes, handouts, assignments, etc. There are many students who have eagerly requested to join the class, but there are not enough seats. I want to include as many students in the class as possible, so I will automatically drop anyone who misses the first two class sessions and try to replace them with unenrolled students who do attend. This is consistent with college policy and with the course description in the catalog. Electronic devices (e.g., phones, tablets, laptops) are not going to permitted in class. If you have a documented need to use a device, please contact me ahead of time to let me know. If you do get permission to use a device, I will ask you to sit in the very back of the classroom. The goal of this policy is to help you stay focused and avoid distractions for yourself and your peers in the classroom. This is really important and turns out to be much more difficult in the presence of powerful computing devices with brightly glowing screens and fast connections to the Internet. For more on the rationale behind this policy, please read Clay Shirky’s thoughtful discussion of his approach to this issue. I will hold regular office hours three times a week in CMU 333. Please come! Also feel free to drop by my (open) office in CMU 337. If you come looking for me in CMU 333 and I am not there try CMU 337. If my set office hours don't work for you please contact me on email to arrange a meeting then or at another time. If, as a student, you have a question about course content or procedures, please use the online discussion board designed for this purpose. If you have specific questions about your performance, contact me directly. I strive to respond to Email communications within 48 hours. If you do not hear from me, please come to my office, call me, or send me a reminder Email. Email communications should be limited to occasional messages necessary to the specific educational experience at hand. Email communications should not include any CC-ing of anyone not directly involved in the specific educational experience at hand. Email communications should not include any blind-CC-ing to third parties, regardless of the third party’s relevance to the matter at hand. As a University of Washington student, you are expected to practice high standards of academic honesty and integrity. You are responsible to understand and abide by UW’s Student Governance Code on Academic Misconduct, and the UW’s Administrative Code on Academic Misconduct, and to comply with verbal or written instructions from the professor or TA of this course. This includes plagiarism, which is a serious offense. All assignments will be reviewed for integrity. All rules regarding academic integrity extend to electronic communication and the use of online sources. If you are not sure what constitutes plagiarism, read this overview in addition to UW’s policy statements. I am committed to upholding the academic standards of the University of Washington’s Student Conduct Code. If I suspect a student violation of that code, I will first engage in a conversation with that student about my concerns. If we cannot successfully resolve a suspected case of academic misconduct through our conversations, I will refer the situation to the department of communication advising office who can then work with the COM Chair to seek further input and if necessary, move the case up through the College. Notice: The University has a license agreement with VeriCite, an educational tool that helps prevent or identify plagiarism from Internet resources. Your instructor may use the service in this class by requiring that assignments are submitted electronically to be checked by VeriCite. The VeriCite Report will indicate the amount of original text in your work and whether all material that you quoted, paraphrased, summarized, or used from another source is appropriately referenced. Material from the Communication Leadership handbook. This page was last edited on 4 March 2019, at 03:08.